The various computers in the car are called "Control Modules" or "Controllers". On this screen, you select which Control Module you want to "talk" to. 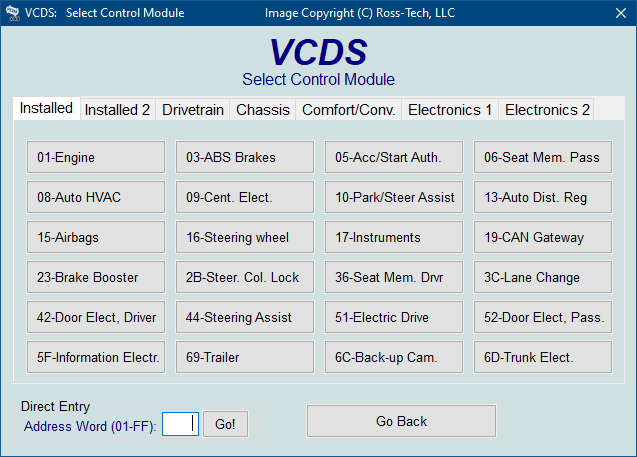 Note: Your car will not have all the Control Modules listed in VCDS, only the ones on the Applications Page for your car. Newer cars have more, older cars have fewer. Each tab on the top of this screen contains a number of different controllers grouped by category. In CAN based cars that have a proper Gateway supporting an Installation List, VCDS will automatically populate one or more Installed tabs containing buttons for only those control modules that are actually installed in the car. It does take about 1.5 seconds to get the list from the Gateway, so a bit of a delay when clicking [Select] is normal/expected. When used on a car which does not have a Gateway that supports an Installation List, the old-style Common tab will still be shown. For customers who use VCDS primarily on older cars which do not have an Installation List available, this feature can be disabled on the User Interface and Identification tab of the Options screen. The other tabs are: Drivetrain, Chassis, Comfort/Conv, Electronics 1, Electronics 2, and LT3. The LT3 is Volkswagen "Light Truck" that is not sold in North America. In these vans, typically only the Engine, Immobiilizer and Central Locks are VW. The rest of the components are supplied by Mercedes but they do not use the normal Mercedes diagnostic tools. Please see the LT3 page for more information. Each controller is listed as a number and a description, i.e., [01-Engine]. The number corresponds to the controller number that you'd find in your Factory Repair Manual in the instructions for using a VAG-1551 or other factory diagnostic tool. To establish communications with a particular Control Module, simply click on the appropriate button. In this demo, any Controller you click will take you to the Engine controller. Examples screens for functions may be from various different Controllers (Engine, Airbags, Instruments).